This is part one of a six-part series on the history of UCMP, excerpted from an article written by Jere Lipps for the California Academy of Sciences in 2004 (reproduced here with permission). Lipps, J.H. 2004. Success story: the history and development of the Museum of Paleontology at the University of California, Berkeley. Proceedings of the California Academy of Sciences 55 (Suppl. I):209-243. The first scientific interest in fossils in the state was by John C. Fremont (right) during his military operations in Mexican California from 1843-44. He had no geologist, but he collected fossils anyway which were later described by James Hall (Hall 1845; Hall and Fremont 1845). When the United States finally declared war on Mexico in May 1846, Fremont, who had been in California agitating for independence, subdued parts of the state, and later accepted the surrender of Andres Pico in January 1847, ending the fighting in California, but not the rest of Mexico. Just before California officially became part of the United States under the Treaty of Guadalupe Hidalgo with Mexico (Feb. 2, 1848), gold was discovered at Sutter’s Mill on the American River (January 24, 1848). Word spread slowly at first (Ryan 1971), to Sacramento, then San Francisco in May, across the Pacific to Hawaii and up the coast to Oregon, but it was not until President James Knox Polk addressed Congress on December 5, 1848, on the abundance and value of gold in California that a country-wide gold rush began (Bieber 1948). The gold-seekers headed west in huge numbers (“The forty-niners”), creating a need for information about the resources of the new territory. Up to this time, the geology of California had been generally ignored, although Philip Tyson and James Dana had traveled through the region, and they immediately reported on the geology of the deposits and of California (Dana 1849; Tyson 1850). The California Geological Survey, December 1863: from left, Chester Averill, assistant; William M. Gabb, paleontologist; William Ashburner, field assistant; Josiah D. Whitney, State Geologist; Charles F. Hoffmann, topographer; Clarence King, geologist; and William H. Brewer, botanist. Photo from the UCMP archives. When California was admitted to the Union in 1850, the new State Legislature soon decided to survey it for natural resources. J.B. Trask, a physician enamored with geology and a founder of the California Academy of Sciences, was asked in March 1853 by the Senate to provide information on the geology of the state, during which some fossils were found but not described. Later that year, Trask was appointed to make studies of the Sierra Nevada and Coast Ranges (Trask 1854, 1855, 1856). His appointment and money received from the Legislature ($5000 for his 1853 report plus $2000 for his expenses) for further studies have been construed as the First Geological Survey of California, but no official act declared that or appointed Trask as State Geologist (Leviton and Aldrich 1982). Apparently, his title of State Geologist, with which he was listed in the San Francisco City directory, was honorific and not official (Leviton and Aldrich 1982). Later, Trask returned to his medical practice, and stopped listing himself as a geologist. At the same time, W.P. Blake was requested by A.D. Bache of the Coast Survey to write a paper on the geology and geography of the coast from Bodega Bay, north of San Francisco, to San Diego. Blake found fossils, including microfossils, at various points along the coast (Blake 1855, 1856). He continued his geologic and paleontologic work with the Pacific Railroad Surveys (Williamson 1856). In the meantime, Jules Marcou published two geologic maps of the United States that showed California consisting broadly of just several types of rocks and some of these were in incorrect relationships with one another (Marcou 1854, 1855). 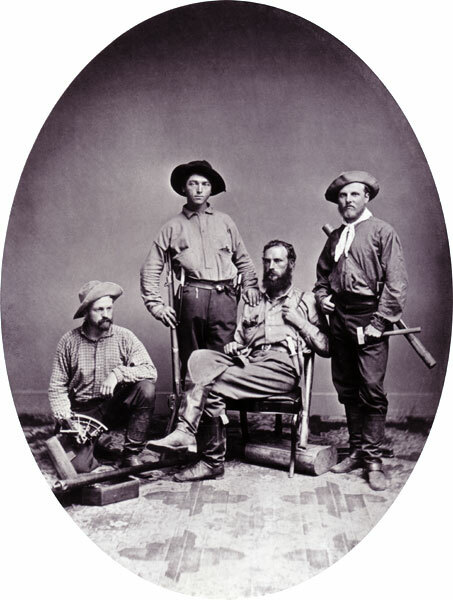 The Geological Survey of California field party of 1864 consisting of William H. Brewer, James T. Gardiner, Richard Cotter, and Clarence King. Click for larger version. Photo from the UCMP archives. All of this activity then prompted the California Legislature to consider an official survey of the natural resources of the entire State, including animals and plants. 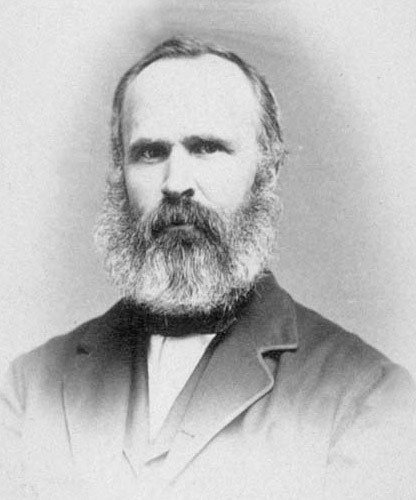 Joseph Le Conte, who later played an important role in the University of California’s paleontological development, wrote from South Carolina to encourage the formation of the survey and recommended W.P. Blake to lead it. But the Legislature asked Josiah D. Whitney (left), a well-known geologist whose book on the Metallic Wealth of the United States (Whitney 1854) was surely influential in the appointment of a geologist to survey a state well known to have such riches. 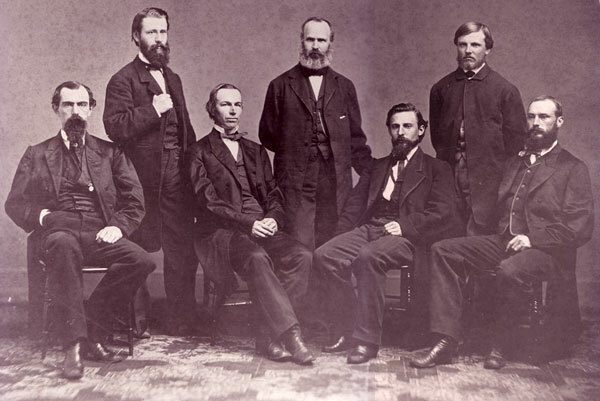 Thus, in 1860, just 10 years after statehood, California had its first official State Geologist and the first Geological Survey of California (above left). Because of the confusion surrounding Trask’s earlier work, the Geological Survey of California has been called the Second Geological Survey or the Whitney Survey, but in fact it was the first and only Geological Survey of California, and remains so today even though the California Division of Mines and Geology was given the pseudonym of the California Geological Survey by the Director of the Department of Conservation in 2002. Whitney was a great scientific geologist who understood that good science had to underlie applied geology, the chief reason that the Legislature appointed Whitney and formed the Survey to begin with (Nash 1963; Oakeshott 1971). By December 1860, Whitney had acquired his field staff (above right) consisting of William H. Brewer (party chief), James T. Gardiner (mining engineer), Richard Cotter (packer) and Clarence King (geologist), and began work. This work included observations on the geology, geography and natural history of the state (Farquhar 1940), as well as the collection of fossils all over the state and even beyond and the study of fossils contributed by individuals (Trask, Mills, Voy) and those held by the California Academy of Sciences. Others were asked to collect and contribute with pay to the Survey as well, including J.B. Cooper, a natural history collector and expert on marine and terrestrial mollusks (Coan 1981). A variety of other living organisms was also collected and later studied (Nash 1963). W.M. Gabb (below left) and F.B. Meek were employed by Whitney to study the fossils. Compare this photo of paleontologist William M. Gabb, dressed in field attire with the one of him in the formal Survey group photo above (Gabb is second from the left). Photo from the UCMP archives. The first volume published by the Survey dealt with Paleozoic and Mesozoic paleontology of California (Gabb 1864a, 1864b; Meek 1864a, 1864b). This beautifully-produced book with gold embossing of an ammonite (taken from Pl. 13, fig. 17 of Ammonites chicoensis Trask) on the front cover and the seal of the Survey on the back (right) was a disappointment to the State Legislature (Nash 1963; Oakeshott 1971), as was the second volume on the Tertiary paleontology of California (Gabb 1869). Indeed, the Legislature did not understand Whitney’s focus on such mundane matters and his seeming neglect of the economic aspects of the work (Nash 1963). Like all state geological surveys from the first one in North Carolina in 1823 to the 51 current surveys (including Puerto Rico), the California Legislature expected that its survey would focus on applied matters (Hendrickson 1961; Nash 1963). It thus cut funding to the Survey. Whitney did not help matters, however, with his direct and blunt style of speaking and writing. In a rather famous geological quote, Whitney said “It is not the business of a geological surveying corps to act … as a prospecting party.” He told the Legislature “We have escaped perils by flood and field, have evaded the friendly embrace of the grizzly, and now find ourselves in the jaws of the Legislature” (Whitney 1862, 1863a, 1863b, 1863c). His budget continued to be cut and by 1867, no more money was available. The conflict with the Legislature made it impossible for Whitney to complete the Survey’s publications as planned, and much of its results appeared later in publications not associated with the Survey or California. By 1874, the Geological Survey of California was over, and it was directed to deposit the fossils and other materials it had collected in the State University at Berkeley by virtue of the Organic Act of 1873, which Whitney agreed to do (Whitney 1873). 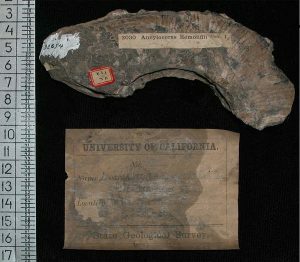 The fossils collected by the Geological Survey of California thus formed the basis of the collection that was to become UCMP’s. However, not all of them were deposited with the University. Whitney took some with him upon his appointment as Professor of Geology at Harvard and placed them in the Museum of Comparative Zoology, and Gabb took most of his type specimens to the Academy of Natural Sciences of Philadelphia (Stewart 1928, 1930). The University of California ended up with 107 types (one example at left) of which about 30 are gastropods and 48 are bivalves (Merriam 1895; Stewart 1928, 1930) together with a few hundred specimens of miscellaneous invertebrate fossils. In addition, the types of J.B. Cooper’s modern mollusks were deposited in the university’s collection with duplicates going to the California Academy of Sciences (Coan 1981). Thus the collections of the Museum of Paleontology had a significant but hectic beginning! The fossil ammonite Ancyloceras remondii, originally described by Gabb in 1864 in the first volume of the Geological Survey of California. The specimen and original GSC label are preserved in the collections of UCMP. Scale in cm. 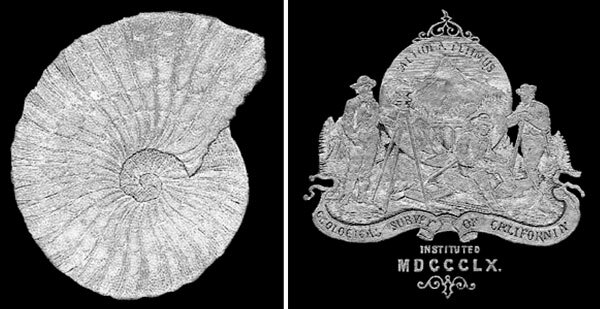 The ammonite and the seal of the Geological Survey of California embossed on the front and back covers respectively of the first official volume (Palaeontology) published by the GSC in 1864. Images scanned from the original binding of the 1864 book.